Spin fristration in three ions. PFC-supported scientists have demonstrated a new way to control quantum interactions that makes it possible to fine-tune the way in which the spin properties of trapped atoms couple to, and are "entangled" with, those of their neighbors -- a development with potentially important applications in quantum computing and condensed-matter simulations. Correlating the spins of two confined ions is relatively straightforward. Three ions, however, pose a challenging problem because there are three competing interactions (between Ions 1 and 2, Ions 2 and 3, and Ions 1 and 3) which produce four possible outcomes: all spins up, all spins down, or two in one direction and one in the opposite direction. It is this last possibility that is problematic, because the third ion has no preferred orientation. 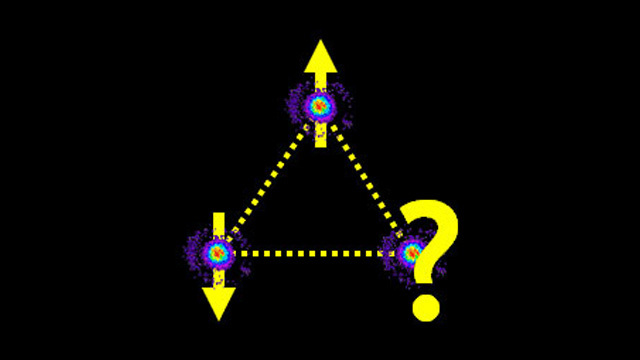 The entire system is caught between two equally energetically unfavorable alternatives, a condition called "frustration.“ The very uncertainty of that condition, however, makes it potentially exploitable as a means of creating entanglement among groups of ions and even ensembles of groups. The team set out to understand and control the behavior of such competing magnetic interactions by trapping ytterbium ions in a vacuum chamber with electric fields generated from nearby electrodes. The ions come to rest and form a linear chain with 2 to 5 micrometers space between each ion. The researchers then direct two laser beams at the chain from opposite sides of the chamber. Each ion responds to the laser beam in a way that depends on its spin orientation, oscillating very slightly in a direction perpendicular to the axis of the ion chain. This "transverse" motion changes the relative positions of the ions and provides a force between them through their electrical repulsion. As a result, the spin properties become strongly correlated through the transverse mode of motion, which is controllable by tuning the laser.